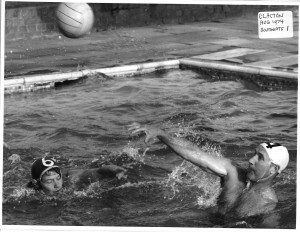 During the latter stages of World War II, the man who would later lead Enfield Water Polo Club, Ken Hall, was serving overseas with the Royal Navy. 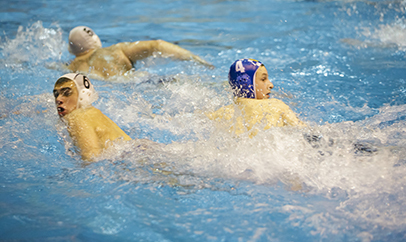 While stationed in Singapore and Sri Lanka, Ken started throwing a ball around and his love affair with water polo was born. 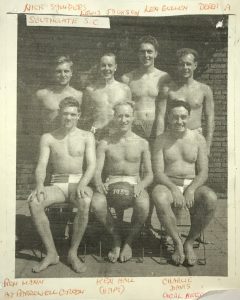 After the war had ended, Ken returned home to London and signed up to Southgate Swimming Club, which was then primarily a Diving Club. 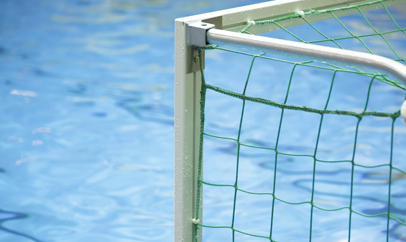 Inevitably, it wasn’t long before a water polo section was formed. 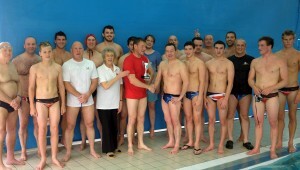 Southgate Water Polo Club proved to be a huge success and swimmers from all across the borough were soon signing up. 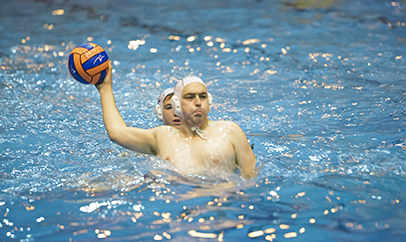 At its peak, Southgate fielded three teams and gained promotion to Division 1 of the London Water Polo League. Southgate WPC circa 1952. Ken Hall with the ball on the front row. Unfortunately, Southgate struggled to maintain those high standards and slipped back down the leagues. 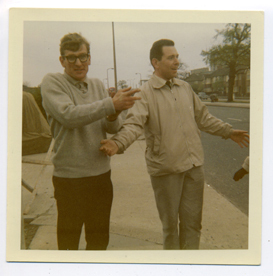 The club carried on, though, and Ken was always there, leading from the front. 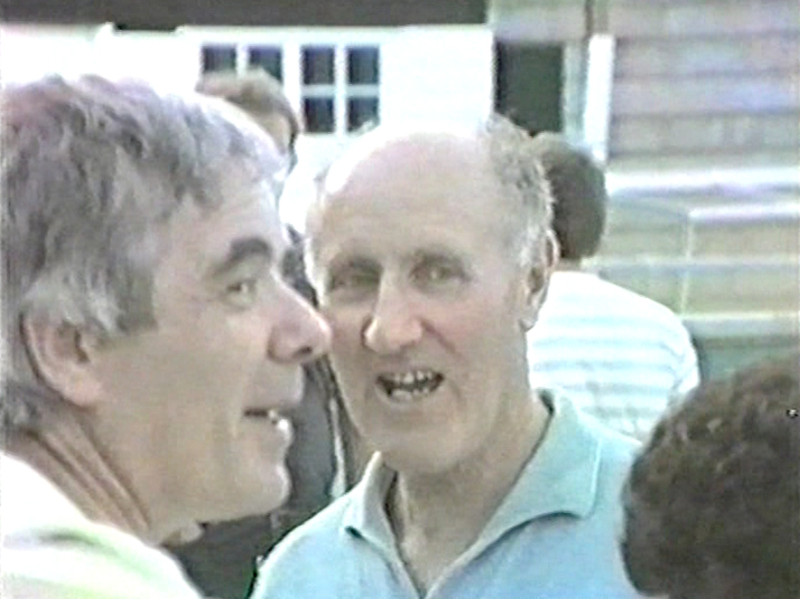 The early years saw Southgate compete against teams such as Northern Lights, Broomfield Park, Hampstead Priory and Great Eastern Mechanics, all of which folded many years ago. 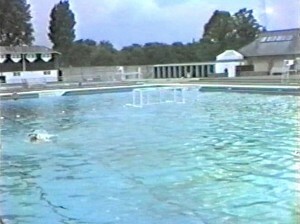 By 1961, Southgate and the nearby Enfield Water Polo Club were both struggling for numbers, so after discussions with Enfield’s Stew Daniels, it was agreed to amalgamate and the newly joint side played their summer matches in the open-air pool at Southbury Road, just off the A10. 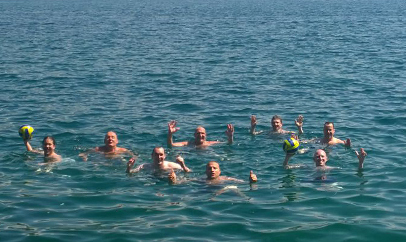 The water was so cold the players believed it was worth a two goals start. Several Enfield players joined Ken’s new team, most notably Stew Daniels, Tony Bonney (Anf) and Malcolm Mitchell (Mitch). Mitch was also the goalkeeper for Enfield Football Club and played in one of the last amateur cup finals at Wembley Stadium. He broke his arm during the first half, but as there were no substitutes in those days, he completed the second half in absolute agony. 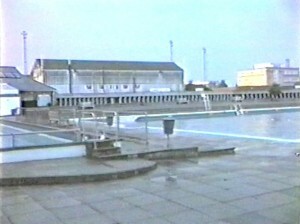 After water polo games, drinks were enjoyed in the Football Club’s bar behind the Southbury Road swimming pool. Youngsters who joined during that period included Andy Boorman, Bob Redrupp and Martin Waller, who became popular for providing hot Bovril on cold nights (most of them). 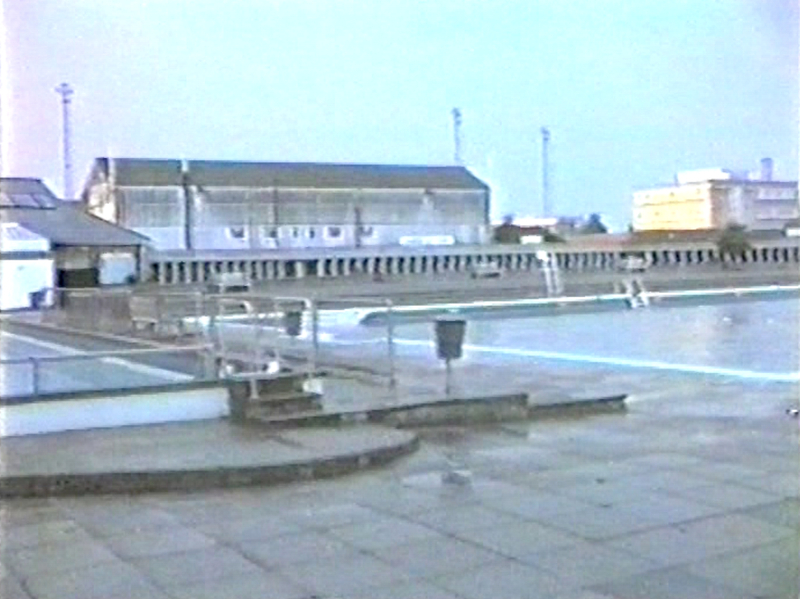 As games began in early June, when the water was still freezing, a variety of methods were employed to help players enter the pool – ranging from running around the 66-yard baths followed by a straight dive in, to the gradual immersion down the steps – a method favoured by Ken. During the 1960s, at least one international trip was organised, to Amsterdam, where memories of the war were still fresh and our players were treated as guests of honour. Each member of the team was paired with a local – male or female – and there was lots of banter about who acquired the most attractive host! Around the 1960s and 70s, a regular feature was the summer trip to Clacton to play on the iconic pier, where a large and enthusiastic crowd was guaranteed, and then later, the club would play at the Highfield Holiday Camp, where again a large crowd would gather. Clacton played on the pier on Saturday afternoons and day-trippers would queue for tickets to see an ‘Aquatic Spectacle’, which included a water polo match. 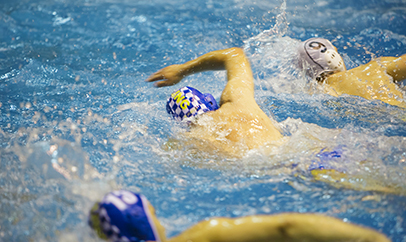 Other events included a race between two swimmers, one out-of-shape and one athletically built. The race would go as expected until a hidden rope pulled the underdog through the water to finish first! 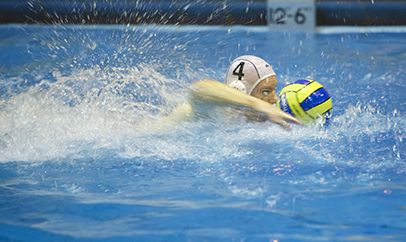 Back in London, pool time was becoming difficult to obtain with water polo being a minority sport. So, after the creation of the London Boroughs in 1965, and the newly-built pools in Southgate and Edmonton, Ken and Fred decided to re-launch the team as The London Borough of Enfield Water Polo Club, naively thinking this would help to get more pool time. Needless to say, it didn’t! To raise funds for the club, a sponsored walk was organised from Southend to Enfield, a distance of 41 miles, which started at midnight Saturday. It was a long old journey, but it was a success and £600 was raised. 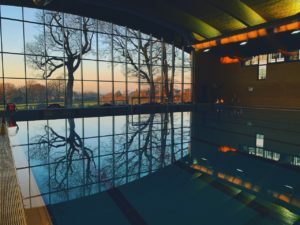 After the walk, Enfield finally did secure more pool time, but only 10-11pm on Friday nights at Winchmore Hill Road, the pool where the club now plays on Wednesday evenings (now known as Southgate Leisure Centre). The Friday sessions finished at 11pm and always ended with a mad dash to the adjacent Fishmongers Arms pub just as last orders were being called! 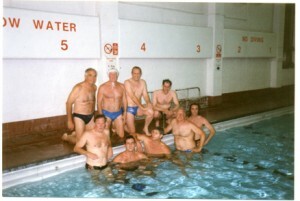 Over the past 40 years, once Enfield Water Polo Club had moved on from Southbury Road, the club has been resident at a number of pools across North London – Clissold Road, Hampstead Priory, Highgate School, and our current homes of Southgate Leisure Centre and QE Boys School in Barnet. 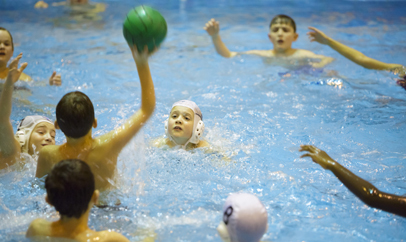 Recently, and largely due to the dedicated efforts of coach Martin Waller, Enfield Water Polo Club has developed an extremely strong Junior Section, with more than 45 youngsters training at Southgate each week. The standards reached have been high with many past and present players representing Middlesex and in some cases, Great Britain. 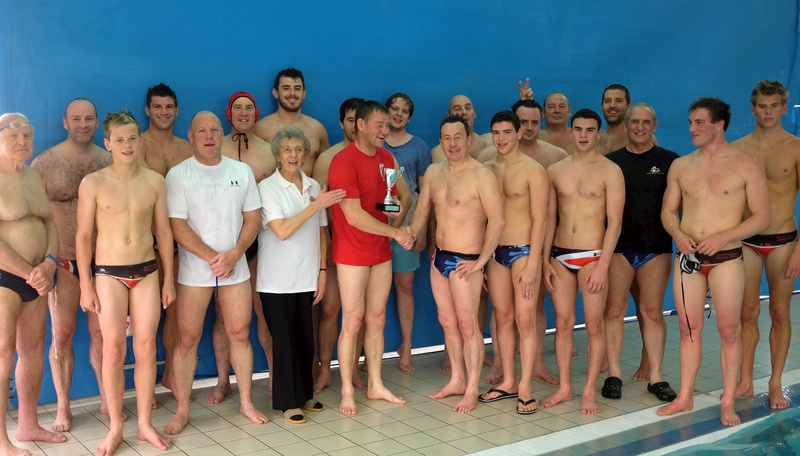 Enfield Water Polo Club has also built relationships with clubs around the country. 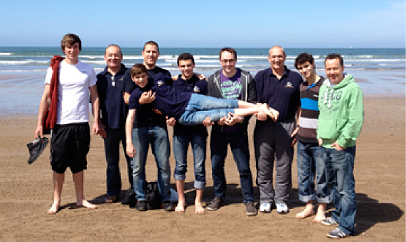 Tours have taken place to Nottingham to play Hucknall water polo club and to Devon to play Barnstaple water polo club. After losing to Barnstaple in 2012, Enfield gained revenge the following year by beating Barnstaple 2-1 to win The London Devon Cup, which was proudly placed in our Trophy Cabinet (behind the bar at The Fishmongers Arms). Unfortunately in 2014, Barnstaple reclaimed the cup with a 6-3 win down in Devon. 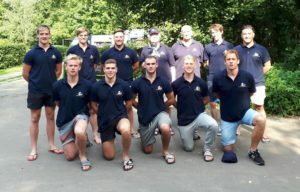 The future of the club looks bright and in June 2014 the club took a strong squad to Skopje in Macedonia to play a series of games organised by Martin Ilievski. Two more tours to Skopje and Lake Ohrid took place in 2015 and 2016. This followed the 2010 tour to Budapest in Hungary. 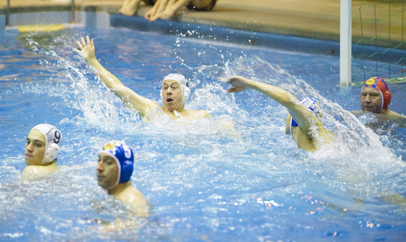 That trip saw Enfield play a top local team in the famous Olympic pool on Margit Island. It was a game that saw Enfield briefly leading, before the players realised the match was one hour long, a rolling clock and one, very long, quarter! 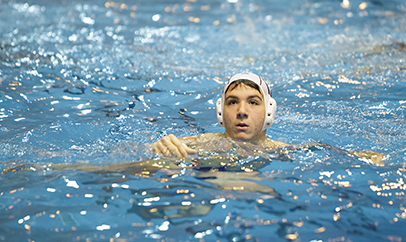 Enfield also returned to Budapest in 2017 to watch the World Championships final and will be in Barcelona in July 2018 for the European Championships. Sunday, 12 April 2015 was a sad day for the club as the news broke that its founder, Ken Hall, had passed away peacefully at Barnet Hospital after a brief battle with illness. 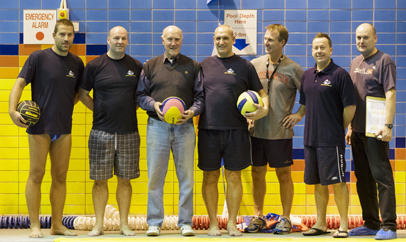 Ken stepped down as secretary in 2014 and was ever-present on the poolside, passing on his knowledge, and he was thrilled to see the club achieving fantastic results and most importantly – a swimming pool full of players – young and old – who share his passion and enthusiasm for the sport he loved. 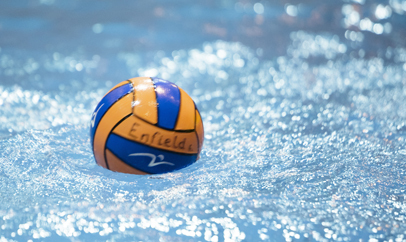 The club is always evolving and we look forward to writing a few more successful chapters in the history of Enfield Water Polo club. 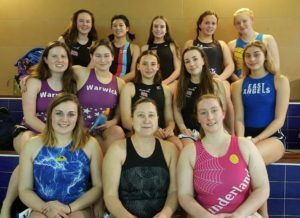 In 2017 Enfield’s first women’s team was formed and competed in the London League. 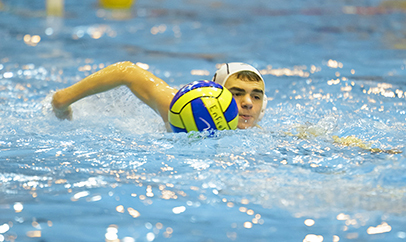 In July 2018, Enfield organised a trip to watch the European Championships in Barcelona and arranged a friendly with local side Club Water Polo Garraf.